Chernobyl has been very high on my list of places to see since I was young. For better or worse, “dark tourism” is something I’m into. 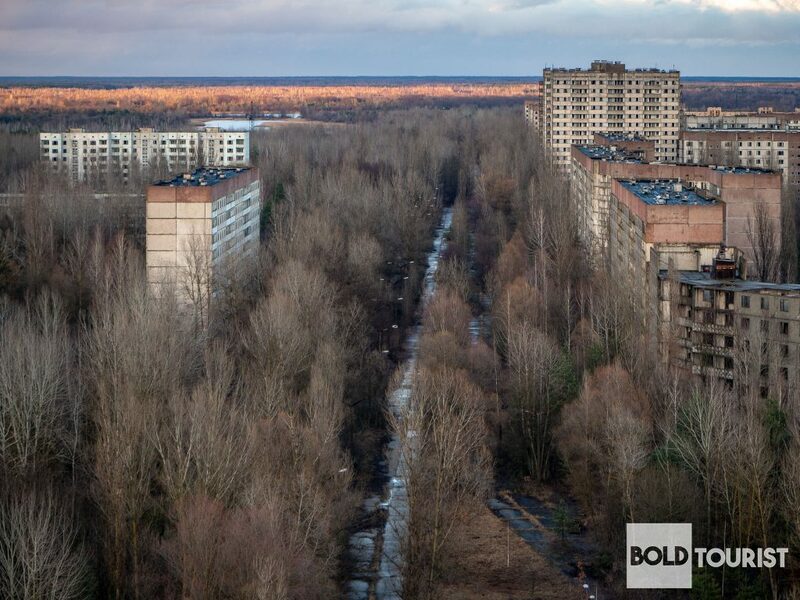 When it was looking like I’d finally have the chance to visit Ukraine and Chernobyl, I wanted to make sure my experience would live up to years of anticipation. 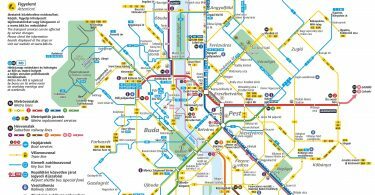 I researched all of the the tour operators, read their reviews, scoured their websites, and had a chat with a few of them. Ultimately, I decided to trust Chernobyl Welcome with making this experience meet my expectations. They had stellar reviews, a well-done website, and their chat support was phenomenal. Booking was as simple as ordering anything else off the internet. About an hour after booking I received an email with further instructions. We had to provide them with some additional personal information, a signed consent form for the Chernobyl power plant, and scans of our passports. The tour reservation would have been automatically canceled in 48 hours had these details not been provided. We mucked up the first attempt at passport scans. They weren’t clear enough and we had to send them again. Ultimately, all went well and approvals were provided. The communication from Chernobyl Welcome through this part was awesome. Because we booked the power plant portion, we had to make a deposit of $170. We were free to pay the remainder of the balance of the tour upon arrival, had we preferred. 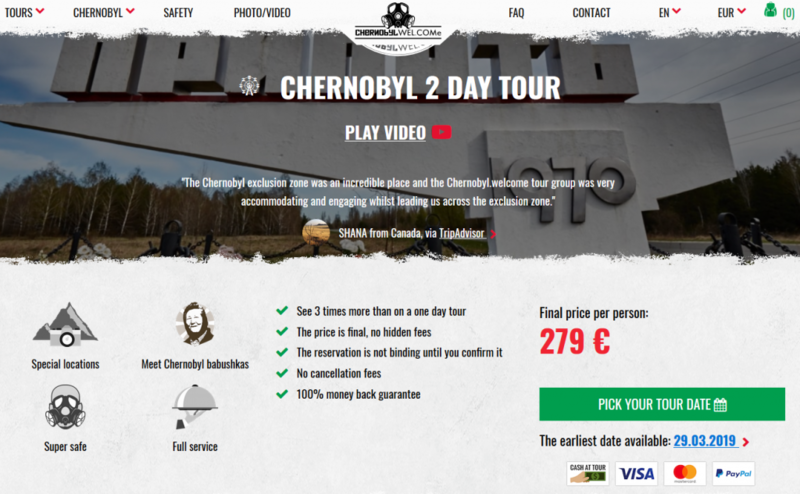 The total price for a private Chernobyl tour for two with the addition of the power plant was $1,460, not exactly cheap. It would have been considerably less expensive had we booked a group tour. Though, when you consider this price included four meals and lodging for two, and a private guide and driver, we decided it was reasonable. This was a once-in-a-lifetime event for us and we wanted to give the experience justice. 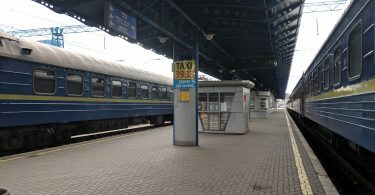 For all tours, Chernobyl Welcome picks you up at the Kyiv-Pasazhyrskyi Railway Station, which was convenient because our overnight train arrived here. Our train arrived a few minutes late. We made our way outside and found our guide and driver waiting in front of the station. Our English speaking guide, Alex, greeted us with a giant grin and a handshake. He introduced us to our driver, Nikolai, who spoke very little English. Once in the van and headed north, they put on a Chernobyl documentary for us to watch. We had seen it before, but I wonder how many people end up on a tour of Chernobyl and this is their first look at the Chernobyl disaster. 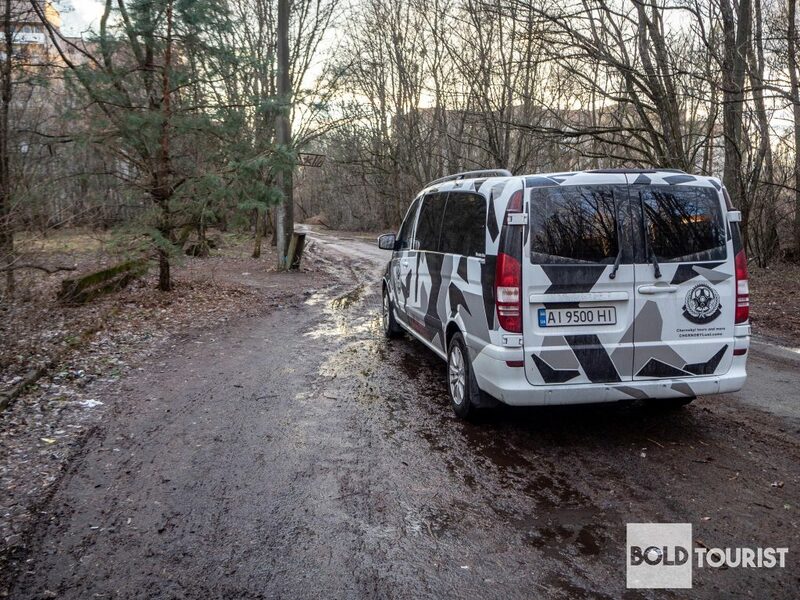 About two hours later, we arrived at the 30 kilometer exclusion zone checkpoint and stopped. Alex gave us our dosimeters and “tickets”. He then explained what was going to happen. We got out of the van and made our way to the border crossing. A guard inspected our passports and tickets. We then crossed the border into the exclusion zone on foot. Our next stop was Chernobyl town and the Desiatka Hotel. Opened in early 2017, the Desiatka Hotel, also oddly known as Hotel Pripyat despite being in Chernobyl, is the only hotel for visitors in the Chernobyl exclusion zone. This is where we’d have lunch, dinner, and spend the night. You can read a more in depth review of the Hotel Desiatka – Pripyat Hotel, the meals, and accommodations. After lunch, our tour began. We spent the day exploring an elementary school, the Pripyat town square, amusement park, hospital, azure swimming pool, another school, and a sports field. Our guide, Alex, was extremely knowledgeable on everything we were seeing. He also had some very interesting photos of the sites we visited in their glory days before April 26th 1986. We ended the day by watching the sunset from the top of an 18 floor apartment building. After the climb back down, it was time to head back to the only market in Chernobyl and then to the hotel for dinner. Day two began at 8:00 AM with breakfast. Afterwards, we were back in the van and on our way to the Duga-1 radar array and surrounding town, about a 30 minute drive. We walked the length of the array and explored the fire station, a building where they would train on ballistic missiles, a theater, and a playground. After seeing this area, it was now time for our tour of the Chernobyl nuclear power plant. We arrived in the parking lot of the power plant to wait for the plant employee who would be conducting the tour. While we waited, two other tour vans showed up. This would be our only complaint for the two days we spent in the exclusion zone and is not the fault of Chernobyl Welcome at all. We had been spoiled on our private tour to this point. We were able to explore at our own pace and were always able to hear when Alex was explaining what we were seeing. We were also able to take photos without worry of someone else in our group wandering into our shot. Having two other tour groups join us for the power plant tour was a little disappointing. 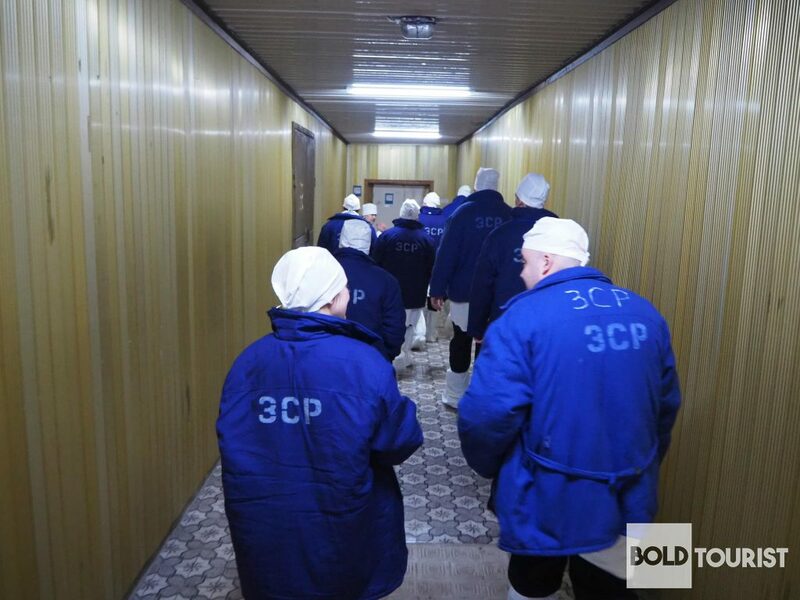 The tour of the power plant is arranged by Chernobyl Welcome, but provided by Chernobyl power plant with an employee as the guide. The plant will obviously fill available spots on their tours. That mild complaint aside, the tour of the power plant was incredible. After passing through some metal detectors and a passport check, we were on to see the safe room and situation room. After that, we were provided a white lab coat type jacket, a large blue coat (it would get cold!) a white cap, and white leg covers. They also gave us a pair of white gloves and a white face mask that we’d need for later. After touring inside the plant, we got out of our protective clothing and boarded a bus headed to the power plant cafeteria for lunch. After lunch, we were back on the bus and went over to the other end of the plant. Ups some stairs, we were in a viewing room with a large model of reactor 4 and a nice view of the New Safe Confinement structure. We received a bit of a long winded overview on everything we just saw and wrapped up the plant tour. We had very high hopes and expectations for a visit to Chernobyl and the exclusion zone. Chernobyl Welcome did not disappoint at all. Their support before purchase was stellar, they picked us up on time, were extremely knowledgeable, coordinated the entire experience perfectly, and went above an beyond a few times to ensure we had a positive visit. Going with a private tour was absolutely the right move and we would definitely do that again. 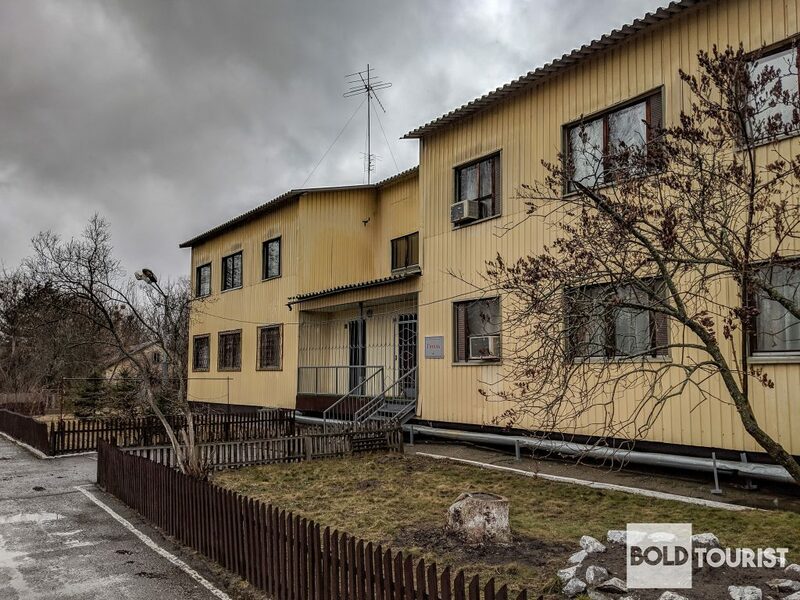 We would not hesitate to recommend them to anyone looking to visit Chernobyl. Here, you can see many more of our photos of Chernobyl, Pripyat, Duga, and the Power Plant.